GBRCTA will supply courts, balls, drinks, snacks and prizes. Registration opens Monday, October 1 and closes Friday, October 26 @ noon! The Championships will be held on Sunday, October 28, 2018 at YMCA Lamar Tennis Center from around 12:30-6:30 pm. Players, please be prepared to play anytime during that time frame! Teams will be formed through a draft. Registration for the Fall Ball Championships will close at noon on Friday, October 26 and a draft will be held Friday evening. All names of registered players will be placed in “hats”. Each hat will represent a level of play (Hat #1 being the most advanced players), and each hat will be labeled a football position. For example, Hat #1: Quarterback, Hat #2: Running Back; Hat # 3: Tight End, Hat # 4: Safety, and Hat # 5: Kicker. The number of hats and the number of names in each hat will depend on the number of players. If a large number of registrants, then more hats (positions/levels of play). If less registrants, then less hats. Once all names are placed in the hats, volunteer captains (TEAM MANAGERS) will take turns picking names out of the hats. In the end, each TM will end up with an equal number of players on their teams (equal in number and in level). Team Mangers will be allowed to have their own kids/grandkids on their teams. We will need a parent/volunteer (Team Manager) for each team! If you sign up as a TM, registration fees for one child will be waived. The Role of a Team Manager: No tennis experience necessary! We would like TMs to attend the draft party on Friday evening, October 26. (Attendance will be recommended, but not required.) After the draft, TMs will be asked to send out an email to all their team members. TM’s will need to attend the Fall Ball Championships from start to finish (around 12:30-6:30pm). TM’s will not be asked to assign “positions” to their players because all positions will be assigned prior to the draft. TM’s will only be asked to keep track of their players and to inform all of their match times throughout the day. Match Format: A round robin type format consisting of singles and doubles; no-ad scoring; first to 6 games; TB at 5-5. In the end, the team with the most games won (not set or match wins), will be the Champs! 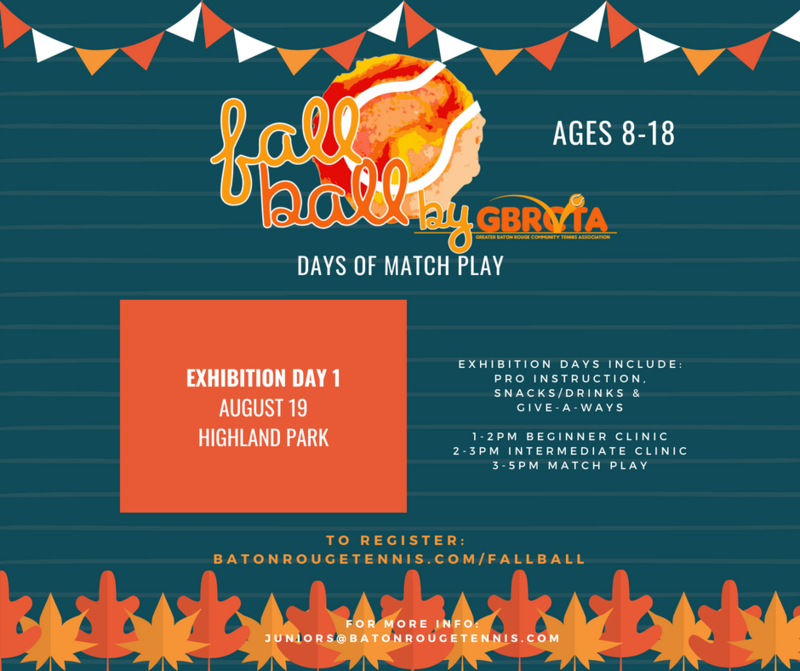 Our Goal: To offer our Baton Rouge junior players fun and organized, yet competitive match play, in a team format!